The 2,000-mile border between the USA and Mexico was established in 1846, after the Mexican-American War was fought over America’s annexation of the Republic of Texas. The U.S. government completed its first border fence in 1911 to halt the movement of cattle rather than to limit the migration of people. Rising concerns over immigrants entering the U.S. eventually led to the passage of immigration laws such as the 1965 Immigration and Nationality Act. The Secure Fence Act of 2006, which was signed into law by President George W. Bush, authorized the construction of 700 miles of fencing and barriers between San Diego and Tijuana. Lower Manhattan’s iconic Wall Street, which was the original home to the New York Stock Exchange, American brokerages, and investment banks, also has a history that relates to a wall. In The ABC of Wall Street, Samuel Nelson Armstrong writes, “Wall Street—the street from which the great community of monetary interests derives its name—is about two-thirds of a mile in length” (p. 10). The street’s name can be traced back to 1653, when Dutch settlers built a wall to thwart invasion. Other historical sources refer to a barrier that was initially erected to keep cattle out. In The Story Of A Wall, Frederick Trevor Hill writes, “It was not long, therefore, before the colonists were hard at work at the projected cattle-guard, and within a few days it was completed” (p. 5). Denmark is currently erecting a 43-mile fence along the border it shares with Germany after two wild boars in Belgium died of African swine fever. This strategic move intends to control animal migration and protect the country’s lucrative pork industry. There’s also Hadrian’s Wall near the Scottish border in Northern England. It served as a defensive fortification and marked the northeast frontier of the Roman Empire for three centuries. Historians believe that construction began around A.D. 122. Some of the stones were eventually removed from the wall and used in the building of homes and roads, but parts of the wall still exist today. He drew a fortification from sea to sea, consisting of a stone wall on the north, and lines of earthen ramparts on the south, with a military way between them. In connection with these lines of defence he built stationary camps, mile-castles, and turrets for the accommodation of his soldiery whether in camp or keeping guard. The line of fortification was not intended as a mere fence to shut out a northern foe; it was intended to protect the troops from surprise either from the north or south, and it was intended to form a basis of operation against an enemy in whatever quarter he might show himself (p. 9). In The Roman Wall In Scotland, George MacDonald writes, “Under the influence of Hadrian, limites had changed their character, and had assumed the appearance of barriers, a development for which peculiarly favorable opportunities were presented in Britain, where the distance from sea to sea was short” (p. 389). 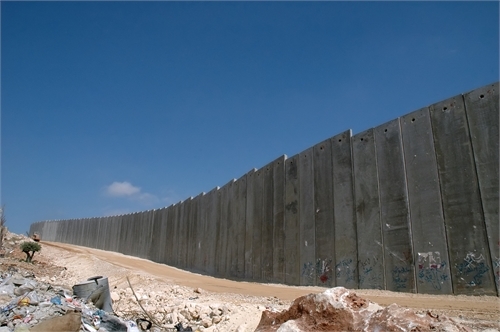 Walls have also been built to protect and keep peace. As Robert Frost wrote in his poem “Mending Wall,” “Walls not only protect those within their circle, but also keep the peace by defining visible boundaries.” In an effort to minimize violence between Catholics and Protestants, peace walls were erected in Northern Ireland. Prague's Lennon Wall features John Lennon-inspired graffiti and lyrics from Beatles songs. People started scribbling messages about love on the wall after Lennon was killed.